DOMSpy shows for all HTML elements, as they are loaded in IE, the exact positioning, the applied style rules and style attributes. You can tweak the embedded style attributes and HTML interactively. Instead of having to tweak web pages by changing the source HTML and reloading the page, you can point to any spot in the browser window, and the program will highlight the HTML element at that location. It shows the exact boundaries of the element, the relations in the HTML hierarchy, the style properties and the style rules that apply to the element. You can change the HTML and style attributes interactively, and see the result immediately without having to reload the page. One of the challenges of creating good looking web pages is to keep track of linked style sheets, embedded style sheets, style sheets included in other style sheets and in-line style rules. Any of these spawn rules that can influence any of the more than 130 style attributes. On top of this, there's relative and absolute positioning, there's block elements versus inline elements and there's positioning in tables that hardly anyone fully understands. With DOMSpy, you can simply point to any element on the web page, and the program shows the positioning, any applicable style rules with their source, and all style attributes with non-default values highlighted. Therefore, web developers and designers can now immediately see the styling applied to any element, and quickly try changes and see the results. 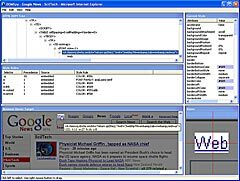 DOMSpy runs on Windows 2000 and XP, using Internet Explorer 6.0. You can download the software for free from here.